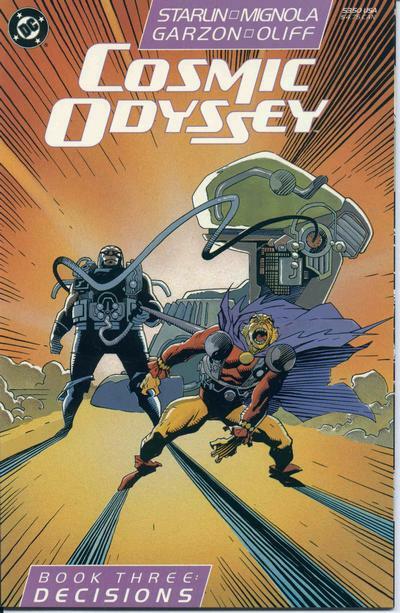 After some cajoling, I agreed to take part in Comic Bulletin's retrospective review of Jim Starlin and Mike Mignola's four-part DC Comics Crossover Event COSMIC ODYSSEY. I was tasked with taking on issue three. So when asked to participate in this series of reviews of Cosmic Odyssey, I agreed out of some sort of sense of obligation (and also because I was drunk and Chase Magnett is so darn cute when he gets excited about these things), rather than any actual interest. Because, really, sometimes it boils down to a simple question: When you already know how the story is going to end, how do you muster up the interest to care? This is the concern of every high-pitched marketing plan and is the fundamental problem I have with Corporate Owned Intellectual Property Superhero comics. These books are so suffused with the bright colored bombast of a simplistic and jingoistic morality wrapped snuggly around an underlying and frightening hypocrisy in which a single definition of “good” triumphs constantly and consistently over a single definition of “bad”. They can’t help but run the gamut from being predictable to being tiresome as they hamfistedly lurch through the trappings of the monomyth, stripping it of any universal truths or insights into the human condition. And yet these stories persist, desperately so, as if their existence fulfills some sort of human need. They become the talk of the town under the illusion of the new, as PR chattel churn out promises of nothing will ever be the same again and you can’t possibly miss this, sadly ecstatic that their heroes are news.